I think 3-Strip Technicolor films deserve as much of nostalgia’s warm embrace as vinyl records. 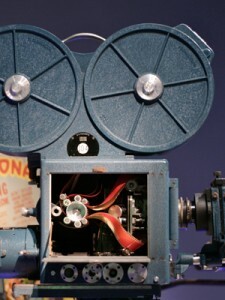 Webcams and mp3s are completely ubiquitous, but their predecessors (and distant ancestors) still hold a certain charm. So, for Eric Rosenthal’s Digital Imaging class I created a few digital images using a process similar in spirit to that of old Technicolor films. As the name suggests, a 3-strip film process is one in which the red, green and blue component images are recorded onto three separate sheets of black & white film. Actually the first version of this process, innovated by Technicolor in 1916, was a two-color system (red and green). The basic idea is the same for both systems: an image enters the camera’s lens and passes through a beam-splitter. The beam-splitter is directed towards two or three color filters, through which the component beams pass onto a film emulsion. Naturally, this process made for a bulky camera and used 2x or 3x as much film stock as a B&W film. Nonetheless, it was an incredible innovation and Walt Disney and others quickly put it to good use. This, of course, was later replaced by color film that allowed the color components to be layered on top of one another on a single sheet of film. In the digital era, this 3-strip idea found new life. Many high-quality digital motion picture cameras still use 3 component image sensors and a beam-splitter. These are commonly called 3CCD cameras. The bottom image is much better than the top. This is largely because the gray card allowed me to better calibrate but also because the original component exposures for the bottom image are better. Overall, the color accuracy to the original scene is pretty good and could certainly be fine-tuned further with more extensive testing. This entry was posted on April 7, 2011, 5:10 pm and is filed under Digital Imaging. You can follow any responses to this entry through RSS 2.0. You can leave a response, or trackback from your own site.